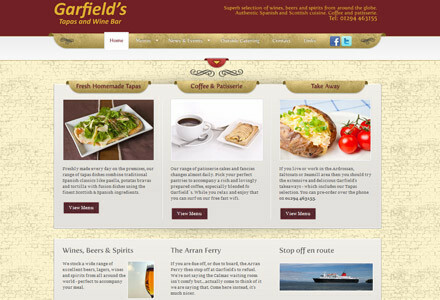 Wordpress was a particularly good choice of platform for the Garfield’s site because the tapas and daily specials need to be updated every day. I built a ‘Dishes Database’ based on custom post types that meant all of the potential menu dishes could be entered in and then dragged and dropped into the correct order, or toggled between ‘draft’ and ‘published’ depending on whether they were on the menu or not. It also features a JQuery dropdown panel (click the Facebook and Twitter icons) that displays a feed of the latest twitter posts, links to the social media, and a section that allows the user to request an e-mail that contains a list of the daily specials. This has been protected with a Captcha to prevent spam.